Launch of New Automotive Interiors Website usa1interiors.com, Find more than just Chevy Truck Interiors!!! Attention!!! Attention!!! Chevy & GMC Truck Owners, USA1 Industries is a different Chevy Truck Parts Supplier. Our staff loves Chevy & GMC Trucks, they love their Job, and appreciate every phone call, email, and purchase our customers make. We are a small business with a huge task ahead. We don't want to just sell you a couple of pieces of weatherstrip because another company is out of stock, or a piece of sheetmetal because we are $10.00 cheaper. 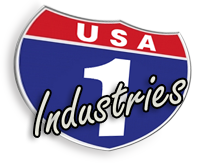 USA1 Industries goal is to help you repair, restore, and customize your 1947-2012 Chevy or GMC Truck. Our knowledgeable staff will be there to assist you with everything from order placement to tech support with installation. We are willing to go the extra mile by researching part information and keeping you updated on your order status through email and phone calls. So if you are ready to work with a company who cares about your truck, business, and satisfaction give us a call at 336-792-2011 or contact us by email. 1958-61 Chevy & GMC and 1967-72 GMC Truck Headlight Bulb, Inner (high beam), Round 5"